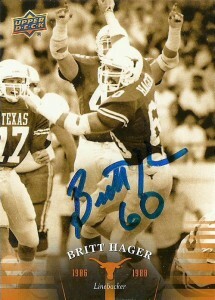 Britt Hager was a ferocious tackling machine over his three years playing for the Texas Longhorns from 1986-1988. He is the school’s single season leader in tackles (195- 1988) and also the school’s career leader with 499. Hager was named All-SWC in 1987 and 1988. Declaring for the NFL draft in 1989, Britt was taken in the 3rd round, with the Eagles’ second pick of that round. With a motor that never quits, Britt fit the mold of the type of tackle stuffing monster that coach Buddy Ryan envisioned in his 46 defense. Added for depth, Hager spent time on the bench behind incumbent middle linebacker Byron Evans making only 11 tackles and 2 fumble recoveries his rookie season. Evans held out for the 1990 season, so Britt started the first game of the season. Evans quickly returned and Hager was sent back to the bench and finished with only 7 tackles that year. Hager didn’t get his chance to start until 1993, and in 7 games recorded 78 tackles, a pick, and a sack. Hager signed with Denver and started 5 more games in 1994, and then made the conversion to right linebacker in 1995. He spent another season with the Broncos, before retiring with the Rams after the 1997 season.